From humble beginnings as a single operator in New Zealand, CEG has grown to include operations located throughout Australasia. For the past 20 years CEG has continued to grow, now having operations located in Brisbane, Australia, and Auckland, Hamilton, Palmerston North and Christchurch, in New Zealand. These have evolved with the changing needs of the market, leading to expansion and diversification of products and expertise to meet and exceed our customers' expectations. 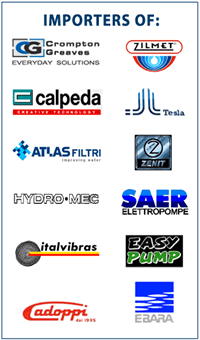 The expansion and diversification of the group now sees CEG offering an extensive range of products including: AC Electric Motors, DC Electric Motors, AC Flame Proof Motors, Water Pump and Associated Equipment, Submersible Pumps, Electronic Motor Speed Inverters, Transmissions, Ventilation and Industrial Fans. In addition the group also operates a full motor/pump service workshop in Palmerston North and Brisbane, allowing the group to provide special one-off modifications and in-house testing of products. So whether you are requiring a motor, pump, or combined motor/pump, motor/gearbox or vsd, CEG can supply a complete package from its in-house products, saving you both time and money by creating an efficient and effective solution. We are independently owned and operated, allowing us to pick only the cream from each manufacturer, resulting in one of the best ranges. This flexibility allows us to supply OEM equipment direct from the manufacturer. With the group importing from various countries around the world a single brand name was needed and the trading name "CEG" (Combined Electrical Group) was born. The CEG group imports from such countries as Italy, Germany, UK, Poland, Taiwan, France, China and India. Minimum energy performance standards (MEPS) for three-phase electric motors were introduced in 2002 and a revision MEPS2 was released in 2006. MEPS2 for motors are prescribed in the joint Australia/New Zealand Standard AS/NZS 1359.5. CEG has been persistent at liaising with their manufactures and undertaking product testing to ensure these MEPS standards are not only complied with but exceeded, delivering our customers highly efficient quality motors. The group has seen much growth and changes over the past 20 years and can only begin to imagine where the market may lead us in the future. As a group that enjoys challenges we are looking forward to seeing the direction of the company over the next 20 years and more. We believe the key to remaining relevant and ensuring the longevity of the company is listening to customers, assessing their needs and ensuring that we are evolving with them.